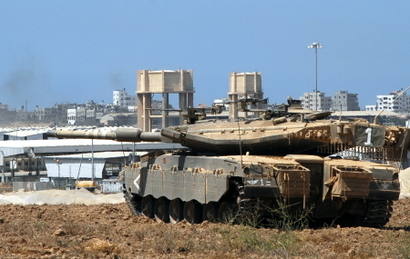 KARNI TERMINAL, ISRAEL-GAZA BORDER -- The Israeli Defense Forces found and collapsed a 200 meter-long and 12 meter-deep tunnel one kilometer inside the Gaza Strip that terrorists intended to reach all the way into Israel. The tunnel was located near the Karni Terminal, a now-closed crossing point for goods and material from Israel into Gaza. Gun battles erupted near the entrance to the tunnel before the charges were detonated as tanks guarded the terminal itself. 20 gunmen were killed. Two months ago Palestinian police stopped a car bomber heading toward Karni. Six months ago the IDF stopped three terrorists with M-16s, grenades, and suicide bomb belts at the Erez crossing point where people, rather than goods, transit into and out of Gaza. On June 25 of this year, eight terrorists used a tunnel much like the one just found near Karni to kidnap the young Israeli soldier Gilad Shalit and steal him away into Gaza. The tanks guarding Karni belong to his unit. Click here to see a video clip of the tunnel’s controlled collapse.